In chess, when we succeed in keeping our pieces active or, even better, more active than those of our opponent, we enjoy a wide choice of good moves and plans. Similarly, if we’ve been able to restrict the opponent’s activity, we’ve also reduced the number of viable options they have, making it more difficult for them to find good moves. And you can even drive your opponent into the anti-activity zone: the zugzwang, where all options are bad! Activity is a major, powerful factor in chess and, surprisingly (to those who don’t know about the deep connection between chess and life), so it is in life. In both cases, activity takes a lot of different forms and shapes. It is a general concept that applies to countless specific, concrete situations. All living beings must do something – moving, acting, reproducing – just to increase the chances of survival. In current society, a person should always stay active physically and mentally, engaged in many undertakings in different fields. New things, interests, friends, and challenges should be periodically injected into our life to keep it flexible, healthy, and full of opportunities. In chess, as in life, activity is a somewhat potential entity; you have to cash in at the right moment, transforming it into a real, permanent result: a +1 on the tournament table, a successful project ending, a plus sum in your bank account. Then you move on to something else. Inactivity, stillness, repetition have to be avoided at all costs. I think you’ve got the point: you can master activity in chess, understand its paramount importance and necessity, and then exploit that awareness in real life! Suggested course: “Grandmaster’s Positional Understanding” – learn everything about piece activity, and positional principles. This is a great concept which I only know about thanks to GM Igor Smirnov’s teaching. In any chess position, if we initiate exchanges of pieces or pawns on a given square, when the exchanges are over an uncontested adversary piece or pawn remains sitting on that square. So, unless we can detect compensation for this fact somewhere else on the board (e.g. favorable tactics and new open lines for our pieces), we would better off to keep the tension, avoiding taking first. To do so, we must be ready to accept and withstand a bit of psychological pressure, because we have to keep a more complicated position under control, one that requires constant attention (and calculations) from our side. True, we also put our opponent into the same situation, and this is why keeping the tension is such a powerful technique. Why, instead, do weaker players tend to release the tension? The answer is quite easy: we just like to gain temporary relief by executing a few forcing moves, getting rid of some of our opponent’s disturbing pieces or options we fear somewhat. But, generally, during a chess game we really cannot afford this luxury. It is also not logical, because very often it favors the opponent’s activity and initiative. In a similar way, sometimes in real life we are confronted with difficult or complicated situations. Understandably, we would like to get rid of them very quickly and in a simple manner. But by settling for a quick resolution or liquidation on somebody else’s terms, we will most likely lose something. It is better to keep all options open till the last moment, looking for some advantage. Of course, we must be smart and strong enough to withstand the stress. 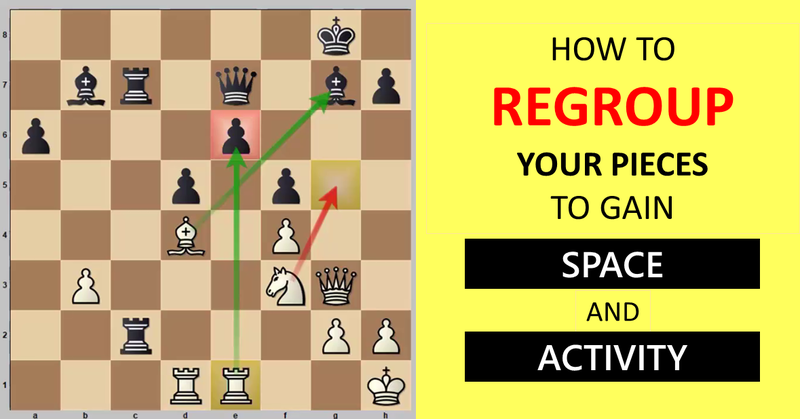 You can train this skill at no risk on the safe chess domain. Then you can put it to good use in more serious situations. The factor of time enters in many chess-related activities. The most basic aspect is the concept of “tempo“, i.e. the right to move alternately that opponents have during an actual game of chess. The value of a tempo can easily be decisive in winning a game. Even in the starting position, when there is no contact between the two armies (they are, in fact, rather distant), the right to move gives White a small but definite advantage. In the middlegame, if only we had the right to move twice, we would most likely get a winning position. During play, we trade a “tempo” for a move on the board, then it’s the opponent’s turn! In this respect, we want to invest that tempo as opposed to spending it. Spend would mean making a useless move, while investing means to make the “right” move that brings us an advantage, immediately or in the near future. The same applies to the time we allocate in deliberating over a move during a chess game and the time we plan for training. If we target to win over-the-board chess tournaments, one hour of game analysis is probably a better investment than playing one hour of bullet or blitz on internet servers. Everything we do should be an investment, not an expense. If we have learned this lesson in chess, we will think twice before wasting our time (or money or efforts) in our everyday life. 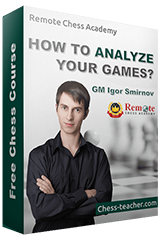 Get “Chess Training Plan for Rapid Improvement” (FREE course) and know the BEST training methods! As someone said (here I imagine a “spaghetti western” movie-kind of character speaking): “Everyone has a time to live and a place to die”! It was not before I studied one of the basic RCA courses that I really grasped this idea. The largest amount of knowledge is useless if you don’t have a thinking process to engage it quickly. In fact, very little knowledge is needed to play very good chess, as long as you have the necessary skills. Those skills can be learned one by one and incorporated into the thinking process until they become like conditioned reflexes. Then you literally forget about them and act effortlessly and with absolute precision. This is clearly not an easy task, otherwise we would all be GMs; but the fact is, in order to improve in chess, you have to make the effort to hone and train your thinking process continuously. Detect the best move in any kind of position! During that training, a peculiar discipline is needed, namely the ability to control the flow of our thoughts. This discipline is a skill in itself. We learn not to let our thoughts spin in random associative chains but we exclude some and keep only the ones we choose. These skills have the deepest value to me, and to explain why, please allow me a little digression. “A state of mind in which our thinking is pleasant a good share of the time“. What an interesting, scientific definition! One of its merits is that it’s devoid of any reference to specific external circumstances (money, love, honors, etc.). I invite you to spend some time thinking by yourself about its implications. Happiness depends on thinking, namely on what we think most of the time, i.e. our thinking habits. Once we learn the methods to train ourselves and establish good thinking habits in chess (substituting them for the bad ones), what prevents us from applying the same criteria to start to improve the quality of our thinking in general? But this topic goes well beyond the scope of this article. At any rate, chess training gives us the opportunity to “learn how to learn” – and this could be a very powerful tool if used imaginatively in different aspects of life. The real world and the chess world seem to follow the same blueprint. We just scratched the surface, listing some of the most noticeable analogies and synergies, with few comments. There are many others, less obvious connections that are left for further investigations. Indeed, chess is much more than a simple game! it just awesome article thankyu so much. thank you,this is very kind of you! I’m glad to hear from you again! Thanks for your positive comment about the article. Most chess players treat it just as a ‘game’. In my view, chess is a tool for our self-development. Sadly, not so many people can understand profound ideas about chess. I’m happy to see that RCA lets such wise people to interact and keep learning.